Photo courtesy of De Beers. De Beers’ new chairman, Mark Cutifani, was greeted by a July sight that had clients, once again, leaving a lot of goods on the table ‒ as much as 7 to 8%. Sightholders said the goods were too pricey for the current market, adding that their banks have become much stingier. For Indian sightholders, the depressed rupee makes De Beers’ rough that much more expensive. The size of the sight was similar to June’s allocation of $585 million, with no significant price changes. Sightholders’ refusal to purchase part of their allocations has become a recurring issue. Diamond manufacturers have been caught in a price/credit squeeze that is taking most of their profits. Rough prices have soared at a rate far exceeding polished in the past three years with some polished goods bringing less than the rough they came from. At the same time, banks in India, which finance a majority of diamond manufacturers, have cut their credit facilities to the trade by an estimated 15%. Adding to their costs, the value of the rupee has plunged more than 10% against the U.S. dollar in recent months, making purchases of rough that much more costly. At the same time, retailers in the U.S. and Asia have refused to budge on prices, preferring to downtrade color or clarity rather than pay the additional cost for higher-quality goods. The new De Beers chairman, also chairman of De Beers’ majority owner Anglo American Corp., has to juggle the challenges of the diamond industry with shareholder pressure to raise revenues and production. AFRICA: Botswana’s first auction of rough diamonds in July realized nearly $20 million, with prices of some lots selling for more than 50% above their reserves. The pilot sale, open to a broader group than the De Beers sightholders, was operated by Okavango Diamond Sales, a government agency located in Diamond Technology Park. Approximately 123,000 carats of rough, in sightbox sizes – ranging from 5-10 carats down to 3 to 5 pointers ‒ and qualities, was auctioned. “Specials” larger than 10 carats, which De Beers sells separately, were not included. Some analysts claim the auction results showed that De Beers’ prices are far too low, noting that some lots greatly exceeded their pre-sale reserves. 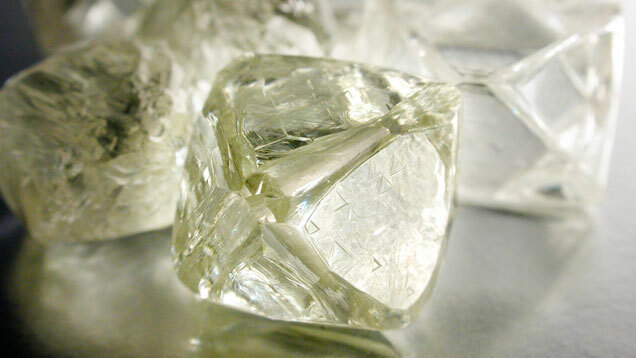 The auction prices, in real terms, were only about 5% higher than Botswana’s 2012 average price per carat. The overall average auction price of $162 per carat was 10.5% higher than Botswana’s average price per carat for its entire production last year ($145), about half of which could be accounted for by the 4% to 6% price increases seen thus far this year. COLORED STONES: Gemfields’ delayed and relocated auction sale of high quality emerald rough realized a strong $31.5 million. The 583,448 carat sale brought $54 per carat, just over $11 higher price per carat than last year’s sale held in Singapore. The sale had been scheduled for mid-June in Singapore. But the Zambian government, which is Gemfields’ 25% partner in the Kagem emerald mine, issued a requirement last spring that all gemstones mined in the country be sold within its borders, forcing the postponement and move. Gemfields’ CEO Ian Harebottle had expressed concern that moving the sale to Lusaka, Zambia’s capital would keep many of the big international buyers away and make sales vulnerable to local speculators, but 37 companies attended the sale, nearly all of them international firms. Zambia, the third-biggest emerald producer, may be backing away from its no-outside- sales-policy, however, saying it may allow sales in other venues ‒ as long as some goods are sold locally. After the sale, Harebottle noted that Lusaka was a “key hub” in the world emerald trade.